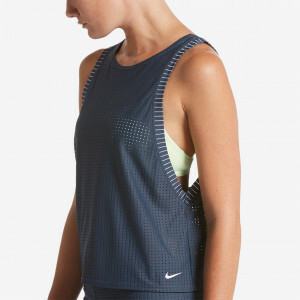 Nike Swim Women's Nike Sport Mesh Convertible Layered One Piece offers a unique interchangeable two-in-one style. It's designed to maximize coverage with a high bust, moderate back and standard leg openings without interfering with your freedom of motion. Breathable mesh fabric allows moisture to escape from the one-piece swimsuit, while quick-drying removable cups add extra support and coverage.